The Dow finished above 19,000 for the first time on Wall Street last night, a landmark in a post-election stock rally propelled by expectations of pro-growth policies from Washington. 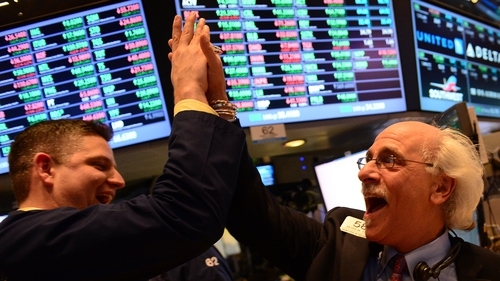 The Dow Jones gained 0.4% to finish at 19,023.87. The S&P also hit a new record, winning 0.2% to close at 2,202.94, while the tech-rich Nasdaq Composite index jumped 0.3% to 5,386.35, also a new record. US stocks have been on an upward ride since the November 8 election, when Republican Donald Trump unexpectedly won the White House and Republicans kept control of both branches of the legislature. Markets are betting that Washington will pursue growth-oriented policies including tax cuts, a ramp-up of infrastructure investments and fewer regulations. Key blue-chip stocks to gain included Home Depot, which won 2.2% after a report showed US sales of existing homes rose in October at the highest pace in nearly a decade. Other winners were Boeing, up 1.7%, Intel, up 1.4% and Verizon, up 2.4%. Retailers were strong ahead of the shopping season, which kicks off with the annual "Black Friday" sales this week the day after Thursday's Thanksgiving holiday. But health stocks, which had rallied right after the election, pulled back. Johnson & Johnson shed 2%, Celgene 2.6% and Merck 1%. Meanwhile, Medtronic, a medical device company, sank 8.7% as it reported lower than expected sales ahead of new product introductions for treating diabetes and cardiac and vascular ailments.